Kisumu Local Interactive Platform (K L I P)has received a massive financial boost from the Swedish Government to cater for the on going scholarship programmes. Speaking during a colourful event in a Kisumu Hotel the Director of the body who is also the Vice Chancellor of Jaramogi Oginga Odinga University Prof Stephen G Agong applauded the staggering 3.7 Swedish Cronar grant.Prof Maria Nystrom who is technical advicer of KLIP from Chalmers University Sweden also told the audience during her speech that its under the sterling tulelage of Prof Agong Nowander they will continue with their noble gestures to the body. The body which is only two years old is so far offering 43 scholarships to PHD students from both Jaramogi University and Maseno University and their specialities covers Eco tourism and market places. Speaking on behalf of Kisumu Governor Jack Ranguma,the executive in charge of infrastructure Eng Vincent Kodero vowed to tackle the dilapidated state of roads in the county which he said are a hindrance to KLIP envisaged goals singling out Dunga Beach road as an example. “We now have the money and the good will is there, count that the said roads as done Kodera told the audience amid applause”.Dunga Beach has been identified as one of the tourist attractive sites.Also through KLIP initiative, another funding to the tune of millions to tackle waste management has also been received and it will soon roll out in the beginning of the year which will be a milestone. Kisumu County Governor Jack Ranguma has suspended six senior city officers over alleged gross corruption and mismanagement of resources worth more than Sh1.2 billion. Ranguma’s action comes following an audit report on the county’s assets and liabilities carried out by the Transition Authority in all the counties.. He is the first governor to act on the TA findings from an audit exercise on assets and liabilities that started on July 15. The audit was to also look at debts carried forward to the counties by the defunct local authorities abolished on March 4 as per the constitution. The audit is aimed at providing mechanisms that will secure assets and liabilities formerly held by the councils. The senior officers sent packing are Adrian Ouma (Engineering Department), Absalom Ayany (Planning) and Peter Kayila (IT Computer programmer). Clerical officers implicated in the scandal are Bertha Odera, Maurice Matunga and Peter Ogada. The officers are alleged to have taken advantage of the transition period by attempting to sell over 500 houses and council estates valued at over Sh1.1 billion to private developers without following the due process. Kisumu County Governor Jack Nyanungo Ranguma is a man under siege. Ranguma early this week arbitrary instructed acting Kisumu City manager Chris Rosana to indefinitely suspend 8 chief officers on alleged grounds of gross misconduct among other accusations. Topping the list of victims is the industrious Town Planner Absalom Ochieng Ayany, Town Eng Adrian Ouma and acting administrative officer Engineering department Morris Matunga. The report suspending the officers among others is a culmination of an audit which was sanctioned by the Governor himself early this year.Its imperative to note that the two purported auditors were Rangumas errand boys during the campaigns and their qualifications to carry an audit of such a magnitude for a county like Kisumu is highly questionable and bordering fraud . And again, such a gigantic audit wasnt advertised for fairness,transparency and competitive bidding.Currently Rangumas blue eyed boys have pitched tent in the payment corridors demanding staggering millions from the cash trapped coffers of Kisumu county. The duo is Odida John who is Rangumas nephew and Haggai Hawi Kadiri,and Kadiri after handing in his half backed and malicious findings landed a lucrative and powerful post of Director of county assistant without adverticement in the dailies as the law stipulates all in a desperate bid to reward his sycophancy and loyalty. And Odida is poised to take over from Interim county secretary Davis Nakitare in a deal recently hatched in Nairobi in one of the top of the range hotels a couple of weeks ago which was graced by his close handlers and think tanks. So far Ranguma has employed over 15 people in posts that are not provided for in the county administrative manual, neither have they been advertised in the print as required by the law. A governor is entitled to officially hire only four officers namely a legal officer, driver, gardener, cook and an aide. Close to over staggering 400m Kshs is alleged to have been spent since he took the mantle without procurement procedures being adhered to. Kisumu is the only county in the entire republic where cash is collected and spent directly without being initially banked in central bank as required by the constitutional provisions. County reps are equally up in arms with the former taxman wondering why he has failed to constitute a public service board to help in the running of the county affairs. 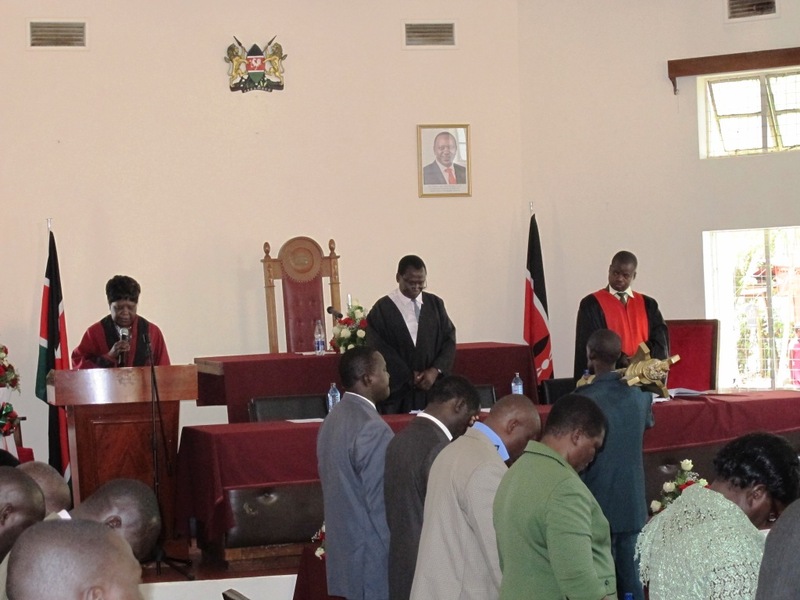 According to the devolution act,the board should be in place within a period of 60 days after the oath has been taken.Back to the suspended officers,Ayany has been given his matching orders for having been over heard telling a land beneficiary to clear council rates so that he can start developing his parcel Kisumu city being awash with housing crisis are a result of the bulging population. The council gave out land in 2010 courtesy of a council resolution but proper policy mechanisms have not been put in place to urge or compel the beneficiaries to develop them.Town Eng Adrian Ouma was shown the door for heeding to Eng Koderas directive to relocate mushrooming kiosks from Gumbi road to Ondiek Highway.Kodera is the Executive in charge of Roads, Public Works and Physical Planning. And Moris Matunga was crucified for not accounting for a paltry Kshs 5000 in the year 2013 when he was in charge of single business permit yet he had left that department two years ago by time the alleged siphoning was done.”Matungas letter read in part,according to our investigations conducted between 15th April and 25th june 2013 it has been discovered that when you were working at single business permit in charge you committed several acts of fraud that were not only contrary to suppose to be due and faithful discharge of you officially assigned duties but is also an offence under section 45(1) of the anti corruption and Economic crimes act 2003″. Some members of the county are also contemplating putting the Governors high handedness and lack of consultation as an agenda this week. Residents of God Nyango in Oyugis town Homa Bay County have applauded a local iron ore mining company for ploughing back to the community by building schools, churches, and offering employment to the locals. The consortium company operating under the flagship Skylight Ltd which is the first one of its kind in Sub Saharan Africa extracts from iron ore products like twisted bars,deformed bars,angles iron,window section,nails and wire rods among others. The exploration work in Oyugis started four years ago and the main processing plant is at Awasi in Nyando Kisumu County where over 1200 locals have been employed. Speaking to the press during a tour by some foreign engineers in both facilities, the Managing Director Janteen Patel praised the local communities for their maximum cooperation and support adding that their attitude will spur development as envisaged in the memorandum of understanding. Mr Patel further emphasised that all the agreed development plans with the locals will be adhered to its entirety. Cabinet Secretary for Agriculture, Livestock and Fisheries Felix Koskei yesterday said fish production has reduced drastically due to excess fishing pressure in the country. Koskei said the production has reduced from 220,000 in the year 2000 to 130,000 metric tons in 2012. He stated that Lake Victoria has been a major contributor of fisheries resource in Kenya, accounting for 85 percent of the fish production in the country. According to Koskei the current fish demands cannot be achieved as the lake can no longer support any more fishing pressure. This, he said called for immediate action and asked for cooperation from all stakeholders to observe the Dagaa (“Omena”) closed season to enable fish to mature. “The demand for “Omena” for animal feed industry poses challenge in as far as availability of fish for human consumption is concerned,” he said adding that anyone found breaching the ban will face full force of the law. Koskei further urged stakeholders to make concerted efforts to ensure sustainable utilization of fisheries resources to reduce post harvest loses and increase production from aquaculture to meet the increasing fish demand. 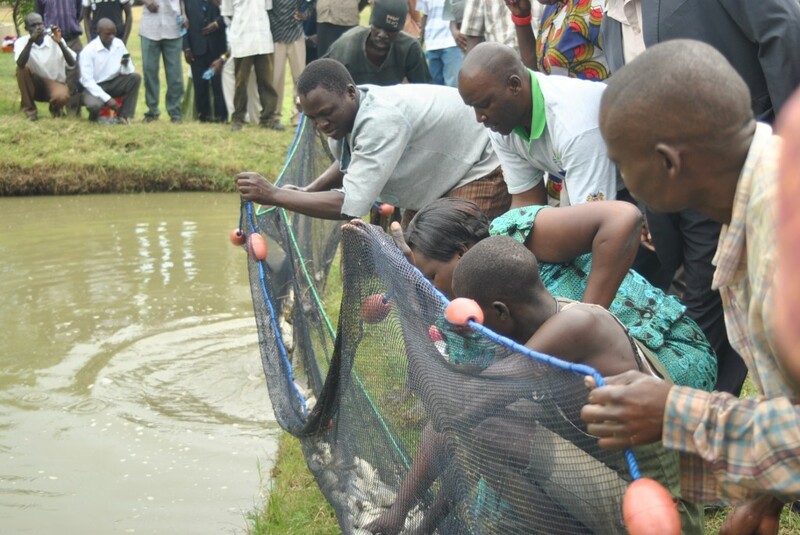 In a speech read on his behalf by Permanent Secretary Prof Micheni Ntiba during fish farming projects tour in Kisumu County, he called small scale fish farmers to take advantage of Trilateral Tilapia Cooperation and do fish farming as a business. 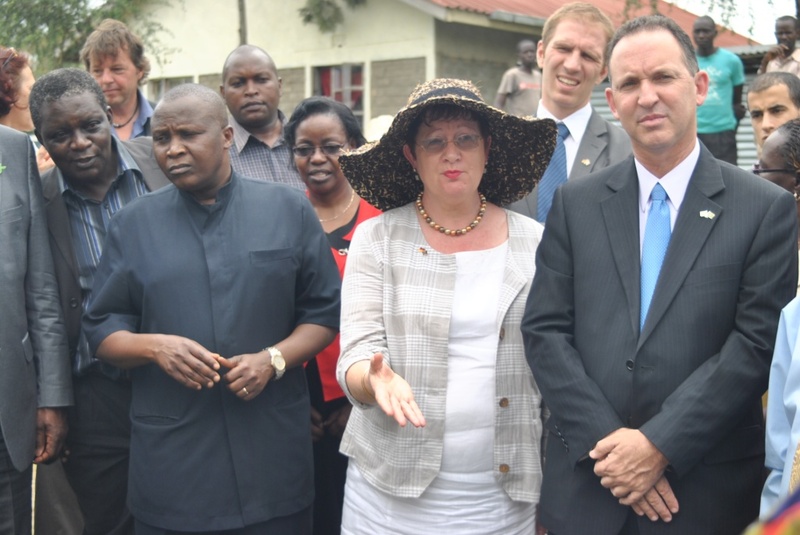 The Trilateral Cooperation is funded by Kenya, German and Israel governments at a tune of Ksh 262.2M. The project is to enhance suitable ways of protecting the Lake Victoria environment by creating alternative livelihood for the community living along the lake. Through the program a total of 132 extension officers out of the targeted 130 and 58 farmers out of 300 fish farmers have been trained. Currently the government has already invested a lot in aquaculture sector by financing the establishment of a bout 40,000 fish ponds across the country through Economic Stimulus Program. However, the German Ambassador Margit Hellwing-Boette and her Israel counterpart Gil Haskelat said the program is to reduce excess fishing pressure adding that the projected started in June 2012 and will end by June 2014. They also said fish project is to improve tilapia aquaculture in Western and Nyanza regions saying Kenya contributed Ksh. 7.98M, German Ksh. 159.6M and Israel 2.3M. Kenya: Worried Parents from Nyanza region – Are teachers able to handle laptop challenges in class? PARENTS from Nyanza Region have called the government to equip teachers with the Information and Communication Technology skills in readiness for the laptops that are yet to arrive in the country by November this year. 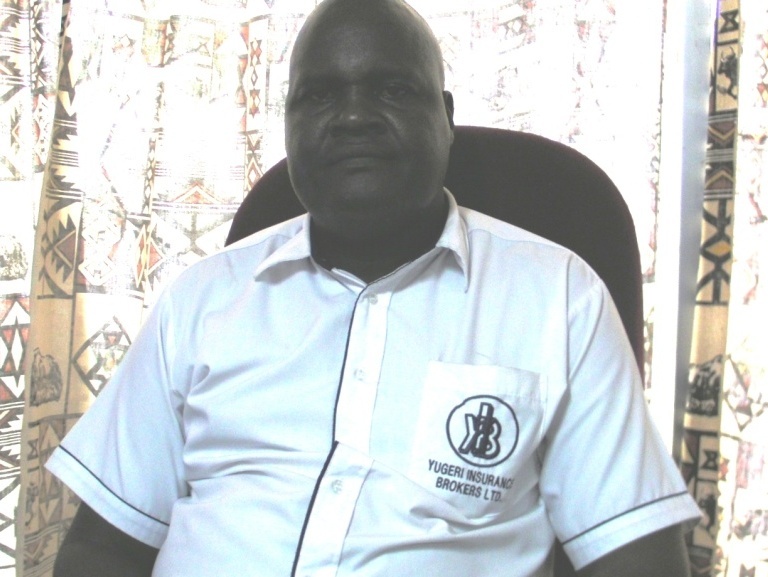 Nyanza Parents Association chairman Mr. Jackson Ogweno said the laptops will only be effective if teachers have the necessary skills to train the pupils joining class one. This follows the promise by the Jubilee government that all pupils joining class one shall be given a laptop for their studies. Cabinet Secretary for Education Prof. George Godia recently said that laptops will be brought in phases as from November 2013. While addressing the press in his Kisumu office Ogweno said it is shocking that about 80% of teachers are computer illiterate and called for immediate action by the government to implement the project fully. He argued that despite the past education skills in most schools laboratory the move by the government to equip class one pupils will transform the education through E-learning. Ogweno commended President Uhuru Kenyatta for introduction of laptop project in schools saying this will lead to massive development in the education sector. However, he stated that this now call for additional employment of teachers to meet the current demands in schools across the country.